On Saturday June 12th, a few members gathered at the home of Sam & Elaine to head out for the First Annual (I hope) Madera Wine Tour. As some of you may or may not know, Madera has a number of small wineries. Some have been in business in excess of 100 years, quietly going about their business of producing small quantities of very good wine. 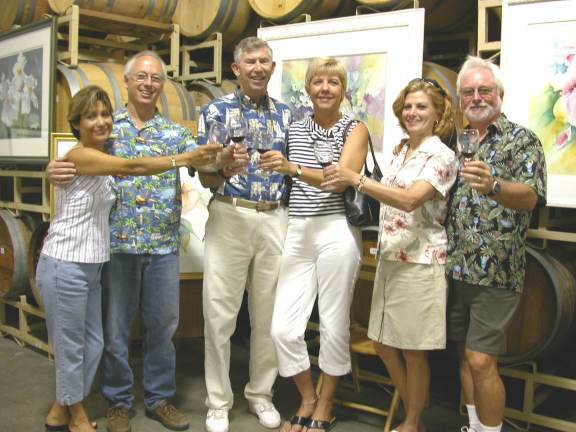 They have recently joined together to form the "Madera Wine Trail". Several times a year, they sponsor a tour, June 12th was one such event. You can start your personal "Tour" at any of the wineries by purchasing a commemorative wine glass for $10.00. You then enter the winery, glass in hand, and sample all they have . . . for free! Besides the fine wines, each winery had some sort of munchies, and art displays. It turned out to be a very fun day. This one came up suddenly, so was never promoted as a "Club Event". However, those that did make it think it should be on the calendar for next year! After sampling about 5 different wineries, Sam lead us off to a small local Mexican Restaurant for dinner . . . After 4, uhhh, 9, uhhh, a few glasses of wine, dinner sounded really really good, and it was! A great big THANKS to Sam and Elaine for putting this one together! Last updated: June 15, 2004.